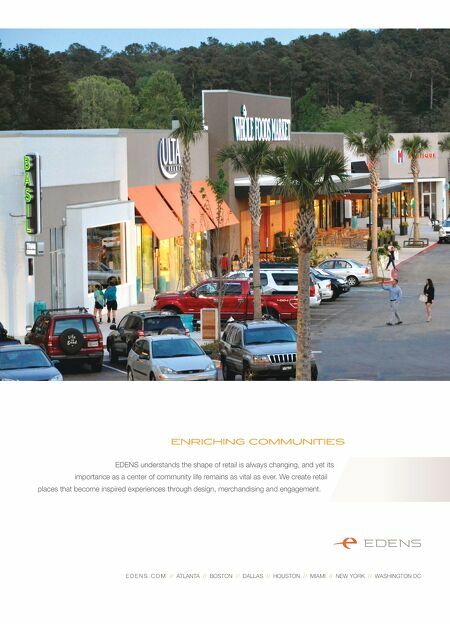 T H E C O M M O N A R E A 8 S C T / A u g u s t 2 0 1 5 "Traditionally, malls have relied on retailers to do heavy lifting in engaging consumers. Now, we need to work alongside our retailers to create our own brand identity." — Chidi Achara, global creative director, Simon Honeymoon in L.A. Los Angeles' Beverly Center hosted 10 LGBT couples from China for a red carpet styling presentation and shop- ping experience to celebrate their upcoming nuptials. Style expert Joe Zee, editor-in-chief and executive creative officer of Yahoo! Style, offered the couples fashion advice and helped them pick out outfits. Beverly Center gifted the couples a total of $10,000 in gift cards to help in prepara- tion of their wedding day. The stop was part of the of- ficial itinerary for the LGBT couples who were invited to get married in West Hol- lywood. The weddings were held at the West Hollywood Public Library on June 9. Bev- erly Center was selected as the exclusive retail partner for the trip due to its long-standing commitment to the LGBT community and welcoming international visitors through its China Ready program. CuRBsIDE PICKs uP The latest shopping-based Silicon Valley startup to snag funding is Curbside, a smartphone app that allows con- sumers to shop directly from their mobile phones and pick up right in front of the store without having to find items on shelves, wait in checkout lines or deal with the hassles of parking. Curbside has secured $25 million in Series B funding to expand to new markets and retailers. The ser- vice is currently available at Target and Best Buy stores in the San Francisco Bay Area, as well as the Westfield Mall Oakridge location. 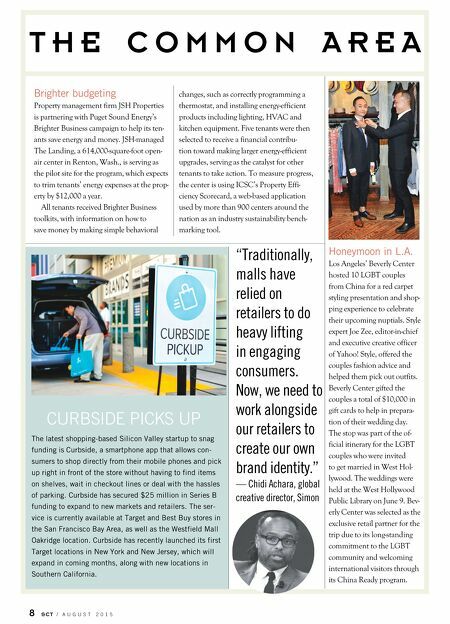 Curbside has recently launched its first Target locations in New York and New Jersey, which will expand in coming months, along with new locations in Southern California. Brighter budgeting Property management firm JSH Properties is partnering with Puget Sound Energy's Brighter Business campaign to help its ten- ants save energy and money. JSH-managed The Landing, a 614,000-square-foot open- air center in Renton, Wash., is serving as the pilot site for the program, which expects to trim tenants' energy expenses at the prop- erty by $12,000 a year. All tenants received Brighter Business toolkits, with information on how to save money by making simple behavioral changes, such as correctly programming a thermostat, and installing energy-efficient products including lighting, HVAC and kitchen equipment. Five tenants were then selected to receive a financial contribu- tion toward making larger energy-efficient upgrades, serving as the catalyst for other tenants to take action. To measure progress, the center is using ICSC's Property Effi- ciency Scorecard, a web-based application used by more than 900 centers around the nation as an industry sustainability bench- marking tool.